Fancy driving your dream car from the UK to France – Switzerland – Italy and Monaco stopping off at the best restaurants and hotels culminating at the Monaco Grand Prix? Well now you can! 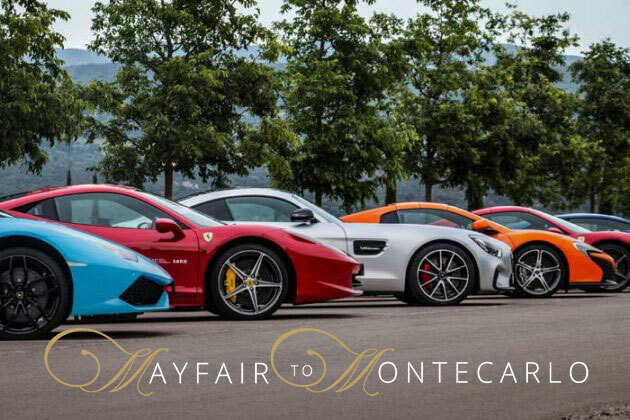 Mayfair To Monte Carlo Supercar Tour is a luxury supercar tour which captures the spirit and excitement of the Monaco Grand Prix perfectly. This year we had Tiff Needell, a British racing driver and TV presenter, lead the tour and join us at the Monaco Grand Prix. The group, limited to a maximum of 25 vehicles, winds down through France, Switzerland, Italy over the course of four days, before three nights in the Riviera. The package also includes our amazing luxury La Maree Restaurant Hospitality venue where guests can enjoy a stunning venue and views of the racing action in Monaco, as well as the option to add two VIP parties in Monaco one on a luxury yacht in the port and the other at Amber Lounge. James from Luxury News Online will be present at La Maree on the Saturday so you get to meet Mr Luxury too!